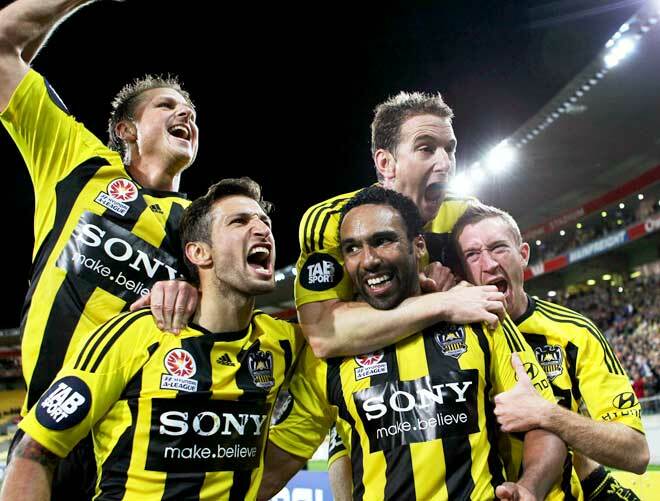 Members of the Phoenix team congratulate goal scorer Paul Ifill during a crucial game against Sydney in the A-League competition on 30 March 2012. By winning the game at Wellington's Westpac Stadium the Phoenix qualified for the next knock-out stage of the competition. Since the mid-1990s New Zealand teams have been part of trans-Tasman professional competitions in rugby union, football, rugby league, basketball and netball.